Novotel Bangkok Platinum’s team visited the children at the Rajvithi Home for Girls on Tuesday, December 18. The team brought presents and pastries to 60 children for the Christmas Party being held on that day. 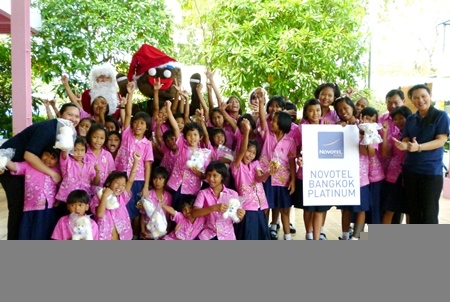 Novotel Bangkok Platinum’s team, led by Kasama Nidaeng, Director of Human Resources, brought cookies, cakes, teddy bears, Santa Claus, Santarina, and the hotel’s signature Gingerbread Man to the children at the Rajvithi Home for Girls. The team entertained the children by playing games and giving out goodies. The girls at the Rajvithi Home for Girls are having a great Christmas party, thanks in part to a benevolent team from Novotel Bangkok Platinum.